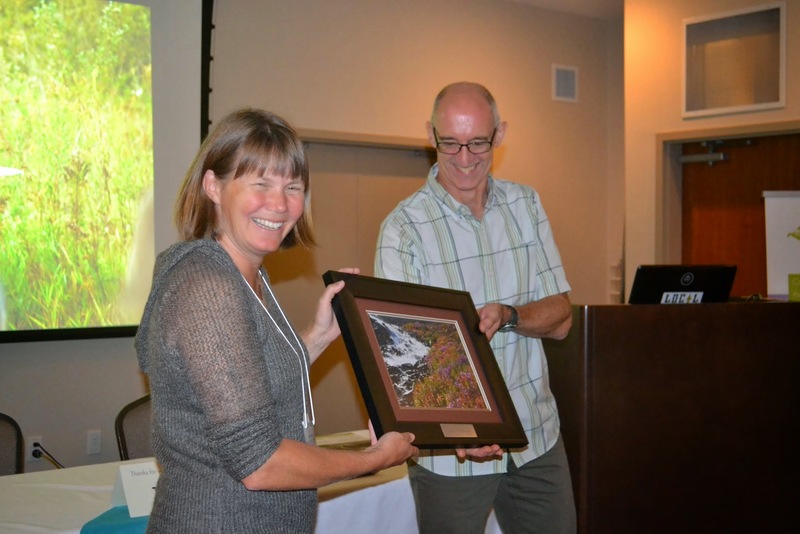 The Kootenay Conservation Program awarded our annual Conservation Leadership awards as part of our Annual Gathering in Creston. Jennifer Yeow and Nancy Newhouse both showcased the outstanding qualities of conservation leaders in the Kootenays. Jen has dedicated herself relentlessly for over 20 years towards protecting our water courses and furthering environmental knowledge, education and understanding of water. 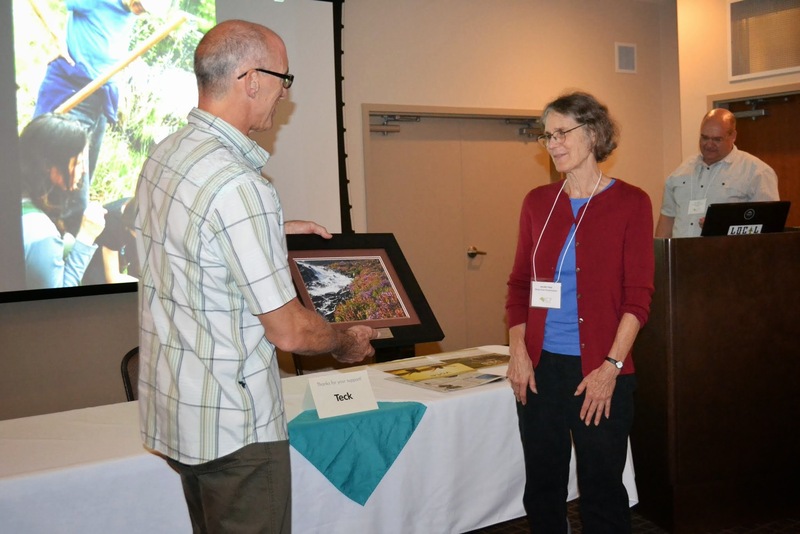 She has worked on spearheading bank stabilization and re-vegetation projects, played a leading role in water monitoring throughout the Kootenays, been active in public outreach and education in schools and at community events and is the founding and leading member of the Slocan River Streamkeepers Society. More recently, Jen has expanded her collaborative efforts with other local groups to form and develop SWAMP (Slocan Wetlands Assessment and Monitoring Project) and raise awareness of the biological importance of wetlands in the Slocan Valley. When she moved to the Slocan Valley in 1990, Jen quickly became involved with the Slocan Valley Watershed Alliance and brought her enthusiasm and hard hitting work ethic to the forefront of numerous local water quality issues and environmental movements. She developed a water monitoring network with several stations and trained volunteers throughout the Slocan Valley and proceeded to provide advice and assistance to other environmental organizations further abroad. In recent years, she has played a leading role in establishing the existing Environment Canada nation-wide CABIN process throughout the Kootenays, bringing continuity to bio-monitoring throughout British Columbia. In 2004, she was a key member in the start-up of the Slocan River Streamkeepers Society, a group dedicated to initiating environmental projects and public out-reach and education throughout the Slocan Valley. Through Slocan River Streamkeepers Society, Jen has started and fostered school-based educational programs focusing on benthic macroinvertebrates as a measure of water quality, especially pertaining to the CABIN protocols. Through her community outreach work she has facilitated within the community a broader understanding of water quality issues as they are related to environmental health. Her ongoing effort with local land owners has helped to nurture an ethic towards stewardship and ecological sustainability. Nancy began working for The Nature Conservancy of Canada in September of 2009 in the role of Canadian Rocky Mountains Program Manager. Prior to this she was the Program Manager for the East Kootenay Conservation Program from 2007 to 2009 and was EKCP Executive Committee Chairperson from 2009 through 2013. Nancy continued on as Past Chairperson of the KCP during 2013. The EKCP was initiated in 2002 with a goal of conserving the working landscape in the East Kootenay through coordinated stewardship and securement activities and over time has evolved into what we know today as the Kootenay Conservation Program or KCP. Nancy has been actively involved in conservation in the East Kootenay for over 20 years. Nancy holds a B.Sc. in Zoology and a Masters of Environmental Design. Nancy has been involved in numerous wildlife conservation projects including badger research, roadkill mitigation, riparian research, and wildlife viewing programs. Her passion is to find ways to maintain the beauty and quality of life in the Kootenays. Nancy is truly a remarkable conservationist and has demonstrated her commitment to conservation and the Kootenays for more than 29 years (many more). She has also invested six years of her life to support, in a variety of ways, the collaborative endeavours of the EKCP/KCP.